The Universe has Brought You Here for a Reason! You are here because you want to attract your perfect customers now, but you don’t want to do it in a smarmy, hypey or fake way. You want to attract naturally, by being yourself. My name is Julia Stege, the Magical Marketer and I invite you to take the first step to attracting your true Soul Tribe online via your website and social media platforms. With this simple process that takes only 5 minutes per day, tens of thousands of heart-based entrepreneurs have started attracting more perfect customers within 48 hours. Create Your Magical Attraction Plan to Attract Perfect Customers in Just 5 Minutes a Day! Magical Marketing Toolkit and start attracting your perfect customers now! For over 15 years, thousands of entrepreneurs around the world have been using this powerful yet simple process to attract the clients of their dreams. 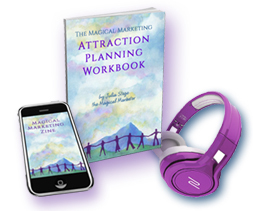 The Attraction Plan* outlined in this workbook will help you to start attracting your perfect customers within 48 hours simply by setting your intention and shifting your vibration. We use this process with all our clients to ensure their marketing reflects their vibration and Soul’s Purpose. In this video Julia Stege, The Magical Marketer outlines the steps of the Attraction Plan and offers tips in how to effectively shift your vibration to attract your MOST perfect customers, those who are aligned with you and whom you are uniquely qualified to serve. 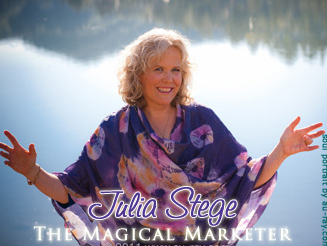 In this video Julia Stege, The Magical Marketer shares her original approach to branding that involves clarifying and expressing your purpose to attract your tribe. Magical Marketing News is sent when we have something special to share including occasional tips, discounts and invitations to free seminars. Use the registration form below to gain instant access to your Magical Marketing Toolkit and start attracting your perfect customers now! * Julia Stege is a Strategic Attraction Coach and BEE-ing Attraction Wizard, certified by Perfect Customers, Inc. to deliver the Attraction Plan to you.